My son has had so many animal encounters to date. Being an only child, we encourage him to take care of our two pet dogs at home to develop a caring personality in him. At least, he can experience how to take care of his pets even if he doesn't have brothers and sisters to take care of. On our trips to the zoo and other animal centers, we let him have a close encounter as much as possible. At Manila Ocean Park, he was tickled by the small fishes in the Fish Spa. He fed carrots to rabbits at Ark Avilon in Tiendesitas. At Chavit Singson's Baluarte in Vigan City, he had the chance to feed the baby goat with milk. 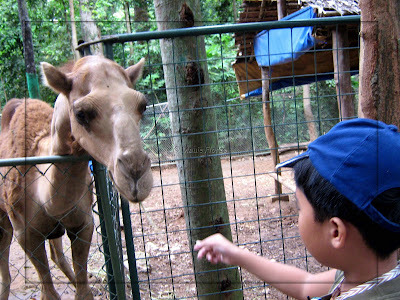 And at Zoobic Safari he fed camels with dry leaves. Do your kids love animals, too? Share about their encounter by joining Mommy Moments. what a brave boy!, mine was scared to even try the fish SPA when we went to Ocean Park. those are excellent encounters with animals. good for the emotions. happy friday, mommy! I didnt get to try that fish spa.. Im sure I'll get ticklish like your son. Lovely photos. have a great weekend! we cant take care of a dog because my little girl has asthma..